The present disclosure pertains to data security, and more specifically, to a method and system of user authentication using an electronic digital signature of the user. An exemplary method includes obtaining biometric data of the user, calculating a biometric key based on the biometric data, identifying encrypted confidential information of the user in an electronic database and decrypting the identified confidential information of the user using the calculated biometric key. Furthermore, the method includes calculating a cryptographic key using a first portion of the decrypted confidential information of the user; generating an electronic digital signature of the user based on the cryptographic key; verifying the electronic digital signature using a second portion of the decrypted confidential information; and authenticating the user to access the data if the electronic digital signature is verified. Using this patent, business entities can deploy NFC-based one-touch payments in various online shopping malls where desktops or laptops are used by users, but also offline shopping malls where IoT devices are used. For example, when IoT devices are ticketing or vending machines, users can tap their smartphone on the machine to pay money for their ticket or drinks & foods. 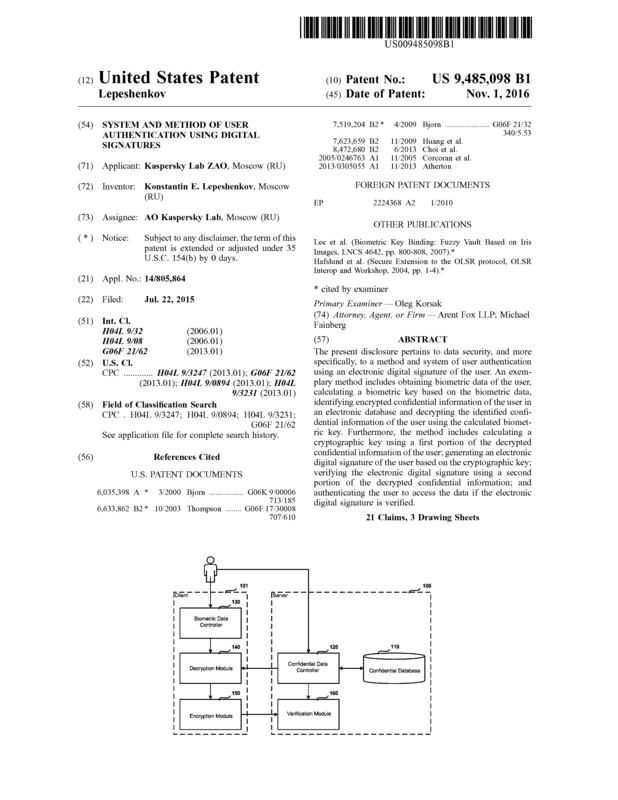 Page created at 2019-04-26 17:46:44, Patent Auction Time.